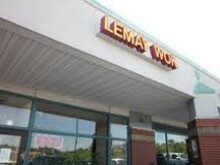 Lemay Wok isn't the biggest or the flashiest Chinese restaurant in town. What this modest storefront wedged into the middle of a south-county strip mall does offer are tasty renditions of the Chinese and Chinese American dishes Americans have come to love: hot-and-sour soup, General Tso's chicken, potstickers, lo mein, mu shu. The sauces are the key. Neither too thin nor too cornstarch-thickened, they balance sweet and savory, spicy and sour. They don't swamp the other ingredients: You can taste the subtle sweetness of the chopped carrots in the kung pao chicken, a hint of ginger in the hot braised pork. The service is exceptionally friendly, but if you really want to appreciate Lemay Wok, order to-go one time and eat it directly from the carton. The burst of flavors from that drab white box will remind you, after who knows how many gloppy, bland Chinese meals, why you fell in love with this stuff.